Click Create tab, on the Forms group click Blank Form icon. Access will display a blank form viewed in Layout View and Field List on the right. 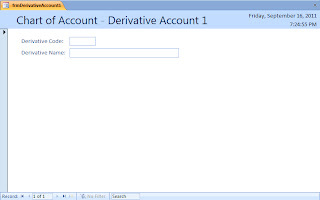 Choose tblDerivativeAccount1 in the Field List. Point the mouse to the field DerivCode1. To put this field into the Layout View of the blank form, double click this field or drag it into the blank form. Do the same thing for field DerivName1. 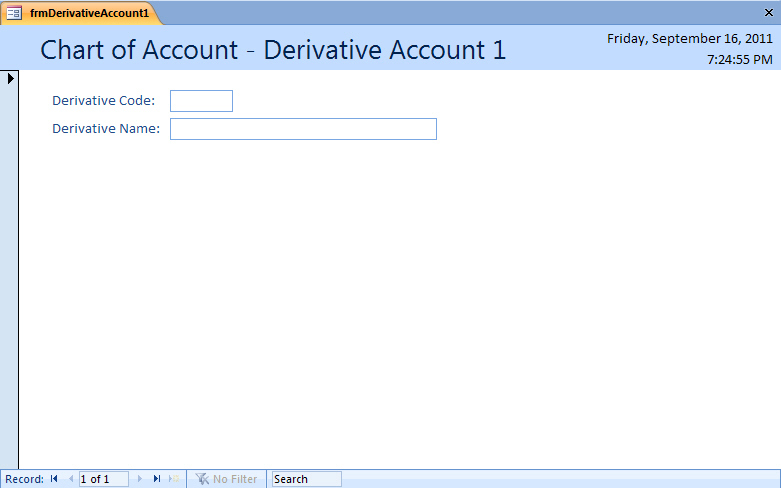 Save first you blank form with the name frmDerivativeAccount1. Click Format tab, and choose or click Title icon in the Controls group. Give the form title "Chart of Account - Derivative Account 1". Click Date and Time icon in the Controls group to add date and time inside the form.